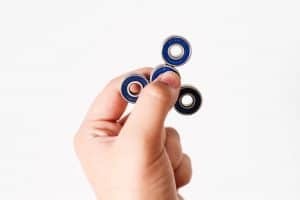 Fidget spinners are so popular right now. I homeschool my kids and we manage to avoid a lot of crazes that the public schools go through. But fidget spinner fever has hit our house. My oldest son recieved a fidget spinner for his birthday from his good neighbor friend. His friend showed him all sorts of tricks he could do with it. I was talking with this neighbor friend and he was telling me how much he felt the fidget spinner helps him while he is at school. While spinning his fidget spinner, he was able to write an extra page in writing, which is a lot more than normal for him. He really felt his fidget spinner helped him a lot. 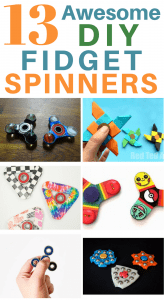 I started looking into the fidget spinner more and was pleasantly surprised to see there are many DIY fidget spinner tutorials out there. Many of the tutorials require you to have a bearing in order to make the spinner, although several do not. If you would like to purchase some bearings, here are some from Amazon that seem reasonably priced. 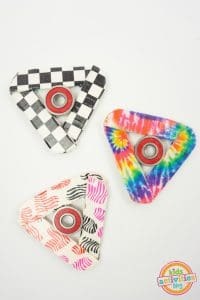 Here is a roundup of the best fidget spinner tutorials I could find. 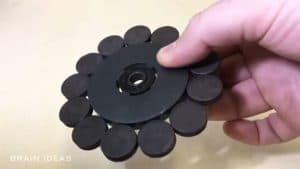 This interesting spinner came from Instructables.com This fidget spinner is a bit different – it is made with magnets! What a fun challenge – have everyone make fidget spinners from lego’s. 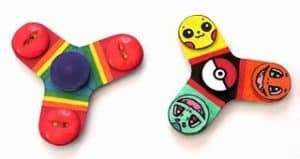 Then, after making the ones in this tutorial, come up with your own designs by tweaking it and see if your kids can improve on the fidget spinner. 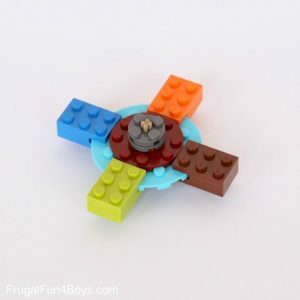 The directions to make this sweet fidget spinner is at FrugalFun4Boys.com. 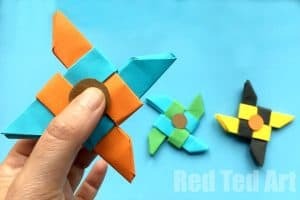 This is a cool way to make a fidget spinner – you make an origami ninja star and then add a modification to it. You don’t need any bearings to make this, you just use normal items you have laying around your house. This one you get to decorate and make it truly your own. This one uses craft sticks and a skateboard bearing. You can find it Kids Activities Blog. 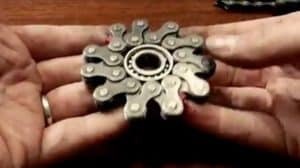 This fidget spinner doesn’t require any skateboard bearings to make. You use cardboard in place of the bearings and it still works really well. The lit of supplies fort this one are all supplies you have around your house. You can find directions here at Red Ted Art. This looks cooler than the fidget spinner in stores. It does not look like a DIY fidget spinner at all. It is made out of wood and it does use a skateboard bearing to make. This would be fun for an older child who enjoys woodworking or a younger child to help someone make. 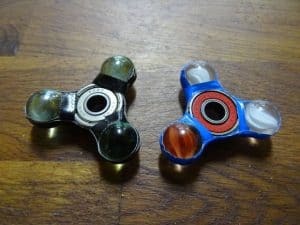 Here’s an intersting fidget spinner that you can make using marbles, duct tape and a bearing. You can find the directions for this one on Instructables. Here is an easy DIY fidget spinner. It uses a template to cut out a piece of cardboard and you can decorate it as well. You can find the template and instrutions at Draw So Cute. There are 3 different fidget spinners in this video. All 3 use a bearing. 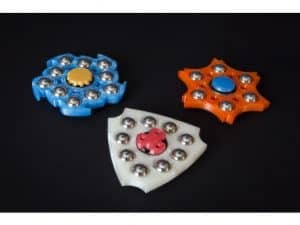 The first and last ones (glitter and polymer clay ones) use a mold that you make from a fidget spinner you already have, but the middle one – the perler bead one does not. The perler bead one is really cool and I personally like better than the one made from glitter fidget spinner or polymer one. 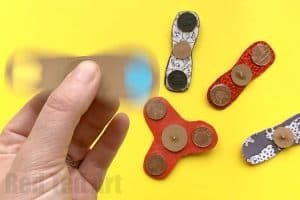 Here is another easy DIY fidget spinner using stuff from around your house. Instead of the bearing, she uses a furniture protector, which is a pretty awesome idea.